In its annual 10-year business jet market forecast released October 4, Jetcraft (SD01) predicted an upward trend for new business jet sales. Jetcraft acquires, trades and brokers both new and preowned executive and VIP jets. Jetcraft’s 2017 forecast calls for 8,349 business jet deliveries by 2026, representing $252 billion in revenues (based on 2017 pricing). North America leads the way with 62 percent of deliveries (5,176 aircraft), followed by Europe with 17 percent and Asia with 12 percent (1,420 and 1,002 aircraft, respectively). Over the past decade the average aircraft list price increased by 56 percent. The forecast sees that number growing by an additional 16 percent by 2026. How might that happen? Jetcraft predicts that 98 percent of the forecasted revenues from new programs will be for widebody or large business jets such as the Citation Hemisphere, Global 7000 and Gulfstream G500 and G600. The latest UBS Business Jet Market Index jumped 10 percent from the August survey as respondents noted healthier pre-owned business jet inventories and improved pricing, as well as higher customer interest. Now at 53, the index score returns to its post-U.S. election high and denotes an improving market. By cabin size, midsize jets took the lead with an index score of 54, up 7 percent sequentially. This was followed by light jets at 53, a 15 percent increase, and large-cabin jets at 51, which climbed 12 percent from August. UBS Global Research said the straight-up measure of absolute business conditions came in at 5.4, up 5 percent from the previous survey and the highest since before the financial crisis. Ortberg remains hopeful that business aviation will bottom out sometime next year. In the meantime, Rockwell Collins has begun to explore synergies between its legacy operation and its new interiors systems business, the former B/E Aerospace. Connecting the B/E Aerospace business, which did not have dealers, with Rockwell Collins’s 300-strong dealer network is one of several near-term business aviation opportunities that the new, larger company is pursuing. The U.S. FAA has granted a two-year extension of NBAA’s Small Aircraft Exemption and removed limitations on the applicability to operations outside the U.S. The approval continues an exemption that has been in place since 1972 and historically ran for two years during each extension. But in recent years, the FAA has granted one-year or six-month extensions. The latest, Exemption 7897I, runs through March 31, 2019, and permits NBAA members who operate piston-powered small aircraft and rotorcraft to take advantage of maintenance and cost-sharing options typically available only to operators of larger, turbine aircraft (more than 12,500 pounds) under Part 91 Subpart F.
Cost reimbursement options are extended under the exemption when NBAA members transport a guest or employees of subsidiary companies on company aircraft. Time-sharing, interchange and joint ownership agreements are also permitted. Previous exemptions did not cover cost-sharing options when the operations were conducted outside the U.S. NBAA has worked with the FAA to expand that applicability to those operations. What’s the worst thing that can happen to your business jet in an accident or incident, assuming that you, the crew, and your passengers all are safe and unharmed? You might think that it’s a situation resulting in a total loss of the aircraft, but that’s not the case. For example, if a hangar roof collapses in a storm, destroying your aircraft and making repairs unfeasible, your insurance company most likely would declare it a total loss and issue replacement funds. However, if your airplane is only damaged, and not totally destroyed, your insurer may opt to repair it, leaving you with an aircraft that operates just fine but now has damage history. 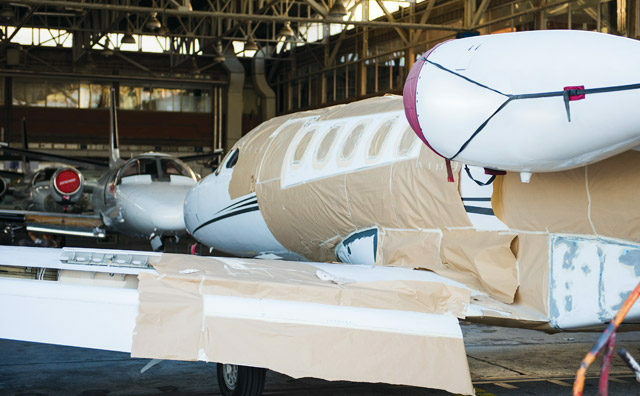 In a depressed used aircraft market, even one that now is showing signs of recovery, an aircraft that has sustained physical damage can be hard to sell. Despite the aircraft having been fully restored to an airworthy condition, and regardless of the quality and completeness of repairs, merely having had any damage will have a negative impact on the aircraft’s resale value. And that is the “hidden damage” that cannot be mitigated or repaired. The amount of diminution of value that results from damage depends on many factors, including the type of aircraft, the extent of damage, the time since the damage, the method and quality of the repairs, and how the repairs were documented in the aircraft records and logbooks, among many others. And the marketplace is less accepting of damage history on certain classes of aircraft. For example, the perceived market stigma of damage is far greater to a corporate jet than it would be to a single-engine trainer aircraft or to a commercial airliner. Damage to any aircraft always is considered a serious matter, especially as it relates to diminution of value. Contrary to past practice, diminution of value resulting from damage cannot be determined easily by consulting accepted, published industry price guides. One cannot do so simply by looking at a chart’s columns stating light, moderate, or heavy damage, and then applying a simple sliding scale formula to be allocated as a deduction to the aircraft value. For that reason, most published price guides no longer include damage deduction charts. Instead, they advise readers to engage “an experienced appraiser” when assessing the fair market value of a damaged aircraft. Level of Detailed Documentation of Repairs (Historical Records). In addition to these analysis factors, current market conditions – that is, the inventory of comparable make/model aircraft for sale – always must be considered for an additional value adjustment based on the current supply versus demand. A damage event is not something that any aircraft owner wants or expects. However, understanding the impact to the aircraft’s fair market value after the smoke clears and the dust settles will be critical to its future resale value. In a move welcomed by aviation businesses, a U.S. district court has issued an preliminary injunction to block a new Department of Labor rule that would significantly increase eligibility of mandatory overtime. The Labor Department (DOL) in May released the rule, which increased the minimum salary for employees “exempt” from mandatory overtime requirements from $23,660 to $47,476. Under the rule, the exempt threshold would be adjusted periodically. The rule was to take effect December 1. Twenty-one states and more than 50 business organizations are challenging the rule, and on November 22 the U.S. District Court for the Eastern District of Texas issued a preliminary injunction blocking both implementation and enforcement of the rule. The court determined that the rule “does not comport with Congress’s intent” as far as who is exempt from the mandatory threshold. The court noted that the rule’s “significant increase to the salary level creates essentially a de facto salary-only test” for exemption, but said this was not in line with congressional intent. While the lawsuit was filed by specific states and businesses, the court decided to apply its ruling nationwide because “the scope of the alleged irreparable injury extends nationwide” and added that such application would protect employers and employees from being subject to different regulations based on location. Aerospace Industries Association (AIA) president and CEO David Melcher lauded the ruling, echoing the belief that the rule exceeded DOL’s statutory authority and cited Congressional Budget Office estimates that the rule would impose more than $1 billion in costs to business. “A responsible increase to the salary threshold for overtime pay is due; however, DOL’s rule moves too far, too fast and disproportionately impacts small businesses, nonprofits, local governments and academic institutions,” Melcher added.